The painting "Millie on the South Lawn" by Christine Merrill hangs at the American Kennel Club Museum of the Dog. Staying away from New York City's newest museum could be ruff. The American Kennel Club Museum of the Dog reopened in New York City on Friday, after spending decades on the outskirts of St. Louis. Located on Bark, er, Park Avenue in midtown Manhattan, the museum's collection includes a terracotta dog paw print that dates back to the Roman empire, a dog-pulled cart from the Victorian era and an extensive array of canine fine art. 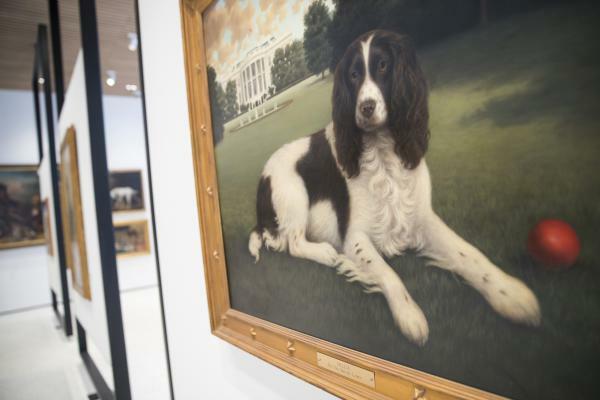 Painted pooches like Millie Bush, who belonged to former president George H. W. Bush, adorn the walls, showing just how prominent our beloved pets can be. The museum incorporates modern touches, too. There are interactive kiosks for visitors to match their facial features to a dog breed; to swipe and learn about the AKC's 193 recognized breeds; and to practice dog training with a virtual puppy. Part of the museum space will also serve as a studio for American Kennel Club TV. The backdrop of the museum is a library with the over 42,000 books for guests to learn more about different breeds or just canines in general. Executive Director Alan Fausel, an art curator and appraiser, told the Associated Press that the museum hopes to give visitors "an understanding of the history of dogs, how they came to be in such different variety." 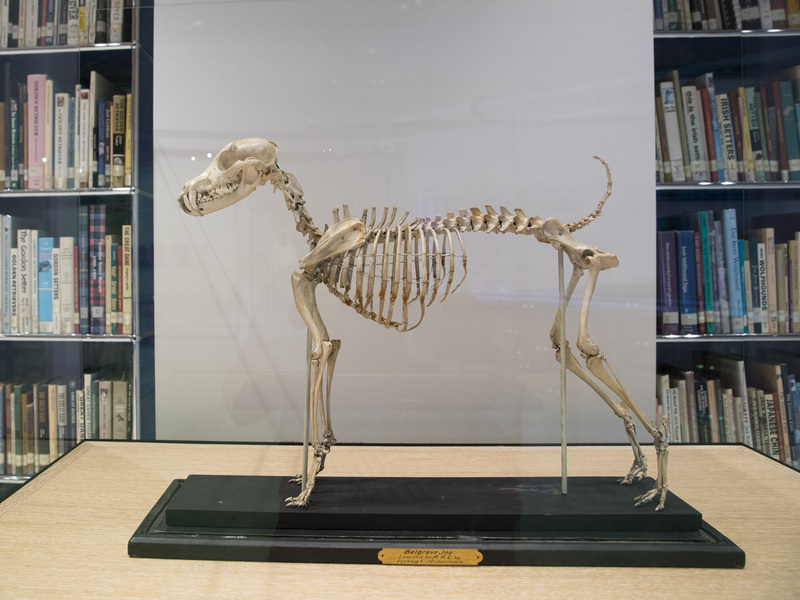 Visitors can see the skeleton of Belgrave Joe, the foundation sire of both fox terrier wire and smooth bloodlines, at the Museum of the Dog. The museum originally opened in 1982 at the old AKC headquarters on Madison Ave. But due to limited space and inadequate financial support, the museum relocated to a mansion in St. Louis, according to a 1986 New York Times interview with a former museum spokeswoman. Now the dog museum has found its way back home, reuniting with the AKC under one roof. Brandi Hunter, the vice president of public relations and communications for the American Kennel Club, says the club hopes the move will boost museum attendance and put the collection back on the world stage. 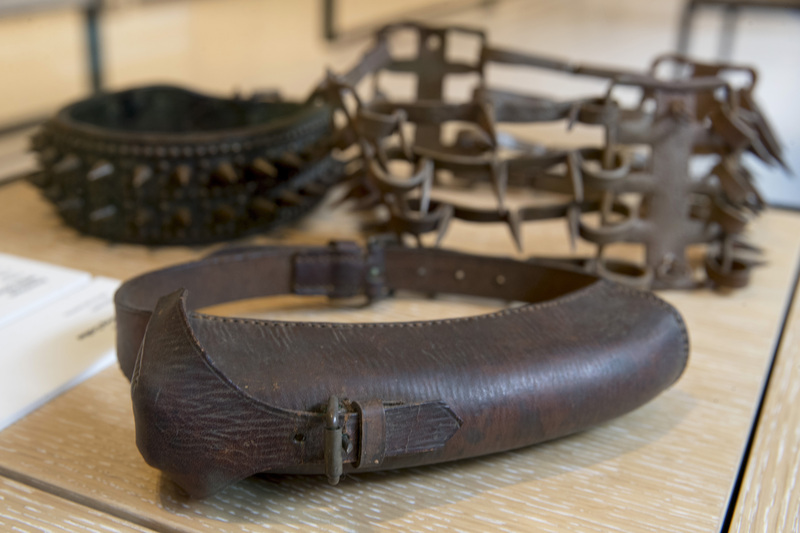 An American World War II messenger collar is on display next to other spike collars at the American Kennel Club Museum of the Dog. "We know how much New Yorkers love their dogs, and we're very excited to educate them more about their dogs and help them discover new dog breeds they've never heard of before," Hunter says. One such new dog breed is the Nederlandse Kooikerhondje, she says, a small spaniel-type dog that visitors can learn more about on the museum's "Meet the Breeds" kiosk.